For now, China’s economic model is an obvious success. China is the world’s largest or second largest economy, depending on how you measure. A recent survey of 26 nations indicated that the Chinese are the most optimistic people in the world about their country’s future. 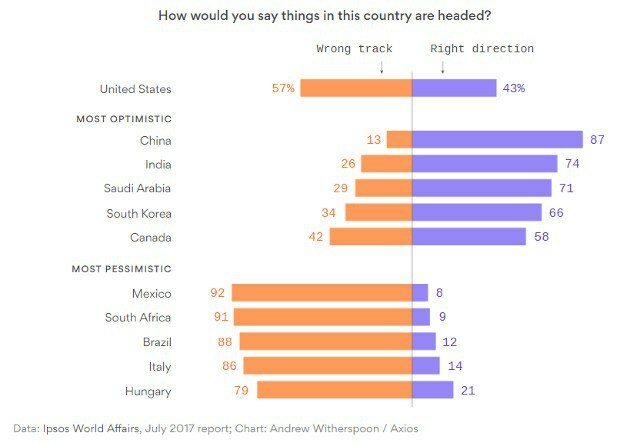 Eighty-seven percent think their country is on the right track, compared to 43 percent for the USA. China is the world’s top exporting nation. Chinese exports in 2017 were an estimated $2.26 trillion, versus $1.55 trillion for runner-up United States, according to the CIA World Factbook. But Germany and Japan had larger trade surpluses than China. Meanwhile, the United States had the world’s largest trade deficit. The Chinese economy has tripled in size since 2009. Eight to 10 million new jobs are created in China each year, versus 1 million annually in India. China is a world leader in domestic renewable energy, high-speed rail and possibly quantum computing. Author Jenny Clegg reports that it has two-thirds of the world’s high-speed rail track, one-third of the world’s wind power capacity, and one-fourth of the world’s wind power capacity. While China is a major user of fossil fuels and emitter of greenhouse gasses, it also is home to six of the top 10 solar panel manufacturers and four of 10 of the top wind turbine manuacturers. There are more electric cars in China than in the rest of the world combined. 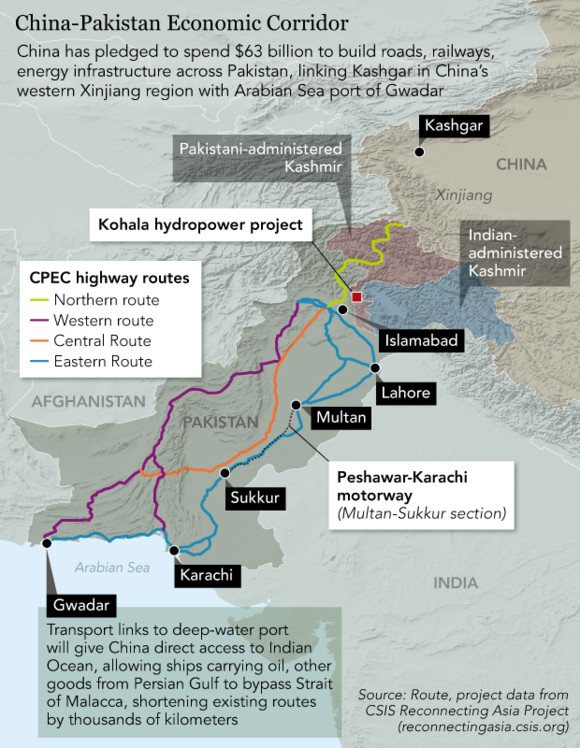 China’s Belt and Road Initiative (aka) the New Silk Road has the potential to transform the world balance of power, economically and geopolitically. The Belt is a series of railroads, highways, pipelines and electrical grids across the interior of Asia, which would this region an integrated China-centered economic whole. The Road is acquisition and construction of ports, mainly in the Indian Ocean, to give China freedom from economic blockade by sea. 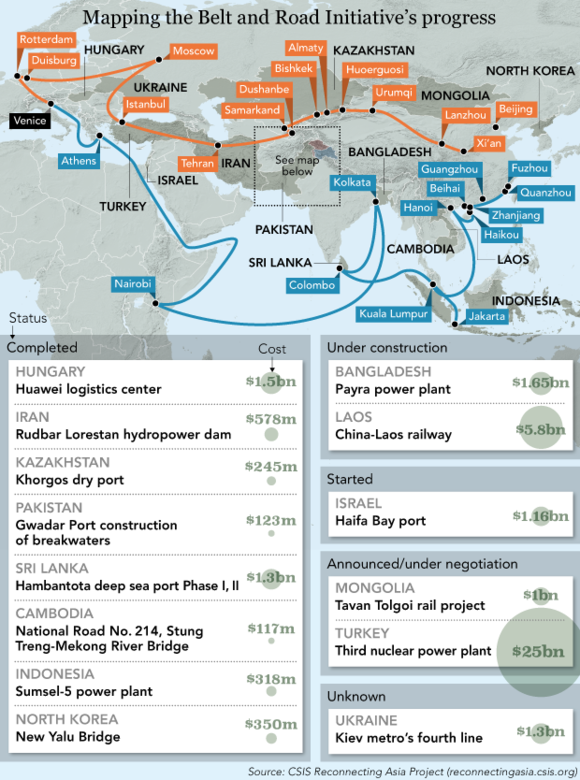 China has earmarked more than $1.3 trillion for these projects over the next 10 years, which, adjusted for inflation, would be three times what the United States spent on the Marshall Plan. Along with this is a series of economic plans, beginning with Made in China 2025, consisting of investment in advanced technologies such as avionics, computer numerically controlled machinery, high-tech ships and rail, renewable energy and pharmaceuticals, with the goal of making China the world’s leading industrial power. China is meanwhile making inroads all over the world, including Latin America, by offering financing for infrastructure projects on cheaper terms than U.S. or European banks will do. It has created its own financial institutions, such as the Asian Infrastructure Investment Bank, to rival the western-dominated World Bank and International Monetary Fund. There are many ways in which this could go wrong. China has invested in many useless infrastructure, comparable to the “bridge to nowhere” in Sarah Palin’s Alaska. Some of the foreign investment seems to be random rather than part of an overall plan. Debtor countries may turn against China. But I would not bet on China failing, or the Chinese government losing control. Xi Jinping has adopted a feasible strategy and the Chinese nation has the resources to carry it out. They don’t have to get everything right in order to succeed. And if the Belt and Road Intiative succeeds, even if only partially, that would be of great material benefit to humanity. The United States, meanwhile, has nothing comparable. We use our existing strength to project military force, carry out covert action and impose economic sanctions worldwide. But these things do not make us stronger. They dissipate our strength and discredit our claim to represent democracy and the rule of law. China projects its power into the United States by means of granting or shutting off access. If an American scholar wants to do research in China, if an American business wants to operate in China, they must follow the Chinese official government line in regard to Chinese sovereignty over Taiwan and Tibet and other matters vital to China. I would hate to see the Chinese system become a model for the world. But if we Americans want the world to follow our democratic ideals instead, the first thing we need to do is to put our own house in order. What Xi Jinping Wants by Graham Allison for The Atlantic. New Silk Roads define brand China by Pepe Escobar for Asia Times. The Decade of a Rising China: 10 Years After the Financial Crash by Jenny Clegg for Counterpunch. Is China’s Belt and Road working? A progress report from eight countries by Go Yamada and Stefania Palma for Nikkei Asia Review. Reverting to Totalitarianism: China’s Response to Perceived Internal Challenges and Threats by Cao Yaxue for Dissident. How China deals with dissent: Threats to family, arrests, breaking in by Alexandra Ma for Business Insider. China’s Xinjiang Province: a Surveillance State Unlike Any Other the World Has Even Seen by Bernhard Zand for Spiegel Online. Communism Inc. by Marion Smith for Dissident. Chinese Cops Now Spying on American Soil by Bethany Allen-Ebrahimian for The Daily Beast. America’s Elite Universities Are Censoring Themselves on China by Isaac Stone Fish for The New Republic. This entry was posted on October 22, 2018 at 8:14 am and is filed under Abuse of Power, Capitalism, Economy, International, The New Normal. You can follow any responses to this entry through the RSS 2.0 feed. You can leave a response, or trackback from your own site. China has a few problems of its own to deal with. An aging population with massive health issues will soon start to weigh heavily. They will not fare well in climate change that seems inevitable. I believe much of the affluence of western nations is derived from *regulated* capitalism. I’m not sure if what the Chinese have is even capitalism, let alone capitalism that is regulated for the well being of the society. I believe they still have a command economy that only simulates capitalism – with an affluent class in the east of a couple hundred million and another billion that is not so well off. It is kept that way just to be cheap labor. 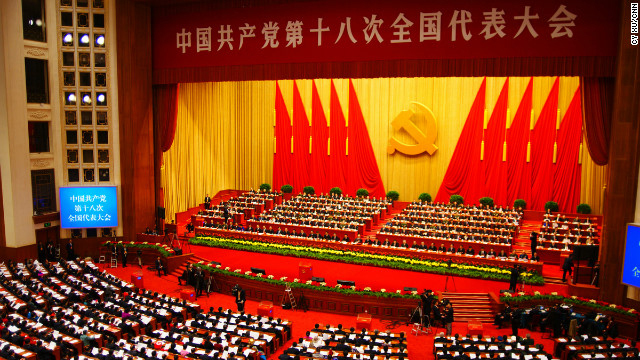 If China were to devolve into a Western-style liberal democracy, I’d be tickled pink. After all, it was a labor union that led to the fall of the Soviet Iron Curtain. I’m sure this fact is not lost on the folks in Beijing. They will continue to suppress freedom as long as they can. But I can’t fix China. All I can do is try to fix the mess at home. Good information, in-depth research. Nice review by Fred.